Rules and guidelines set forth by FCC and CTIA for sending text messages are already handled for you behind the scenes. Legal Disclaimer: The article is for informational purposes only and does not provide legal advice. Materials on this website are published by Kimoby to provide your business with free information regarding the laws and policies described. While Kimoby provides a communications platform built with compliance in mind, you should contact an attorney before launching a text message marketing campaign for your business, or with any questions or advice pertaining to the Telephone Consumer Protection Act. One of the most important aspects of the TCPA is that your business must obtain Prior Express Written Consent from customers before sending them any marketing text messages. Under the TCPA, a message is characterized as telemarketing or marketing if it is issued for the purpose of encouraging the purchase or rental of, or investment in, property, goods, or services. The FCC has ruled that if your customers give you their mobile phone numbers, whether in writing or orally, they have given consent for your business to contact them with informational or transactional messaging, as long as your messages don't contain any marketing or promotional material. Service advisors texting customers about specific repair orders, repair estimates, approval for job repairs, or in direct response to general information or service quote requests. Service work status and progress updates via text. Vehicle-ready notifications, payment requests and successful payment confirmations via text. Post service follow-ups, thank you notes and satisfaction surveys via text. Service appointment reminders and rescheduling instructions via text. Safety recall notifications via text. Meanwhile, it’s important to consider your customers' expectations when they give you their mobile phone numbers. Make sure to let them know exactly what kind of messages they should expect from your business and always keep the message content in context of the last interaction. Always include your name or business name within the message and avoid including marketing material or anything which may indicate an indirect attempt to promote, upsell, or cross-sell. For example, a customer brings in his vehicle for an oil change and the service advisor texts him about his tires needing replacement. In such an event, it could be argued that texting the customer, who initially came in for an oil change, about his car tires that need to be replaced, is not only out-of-context but also makes the message marketing by nature. The TCPA stipulates that text messages may only be sent between 8AM and 9PM in the time zone your recipient is in. TCPA requires that your recipients should have the ability to opt-out at any time. Support instructions leading to more information about the messaging program. The disclosure that message and data rates may apply. Recipients can easily opt out of receiving your text messages by texting any of the following unsubscribe keywords: STOP, END, QUIT, CANCEL or UNSUBSCRIBE. Whenever a recipient chooses to opt-out, Kimoby automatically handles the incoming opt-out keyword, updates your Do-Not-Contact List and deactivates any further sendings to the recipient's mobile phone number. The entire unsubscribe process is seamlessly handled for you behind the scenes. Moreover, Kimoby logs and stores all opt-out requests and makes your unsubscribe list (Do-Not-Contact List) available at all times in case your business ever gets legally challenged by message recipients. Not everyone is comfortable with opt-out keyword commands. Therefore, your recipients can also request to opt-out in their own words by replying naturally to any of your text messages, like the example shown below. 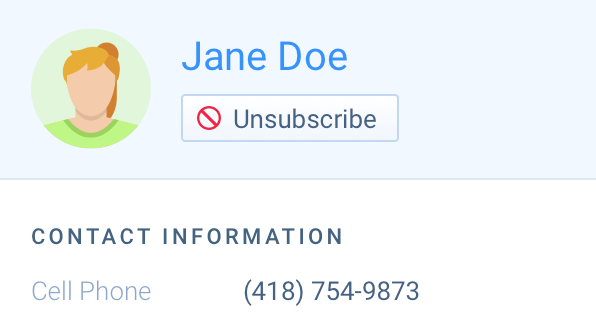 The recipient's opt-out request is viewed in the conversation screen by one of your staff who then handles the unsubscribe process manually using the unsubscribe button found in the customer profile screen. TCPA – Telephone Consumer Protection Act. TCPA is the federal law that regulates telemarketing and the use of automated telephone equipment for voice calls, faxes, and text messages. FCC – Federal Communications Commission. The FCC implements the rules about how the TCPA needs to be enforced. CTIA – A trade association representing the wireless communications industry in the United States. The CTIA guidelines contain a lot of detail about the information and instructions that should be included in commercial text messages. CTIA guidelines aren't considered law. Therefore, businesses can't be sued over them. However, text messaging programs that ignore the guidelines can be blocked and shut down by one or more mobile carriers. ATDS – Automatic Telephone Dialing System or Auto-Dialer.